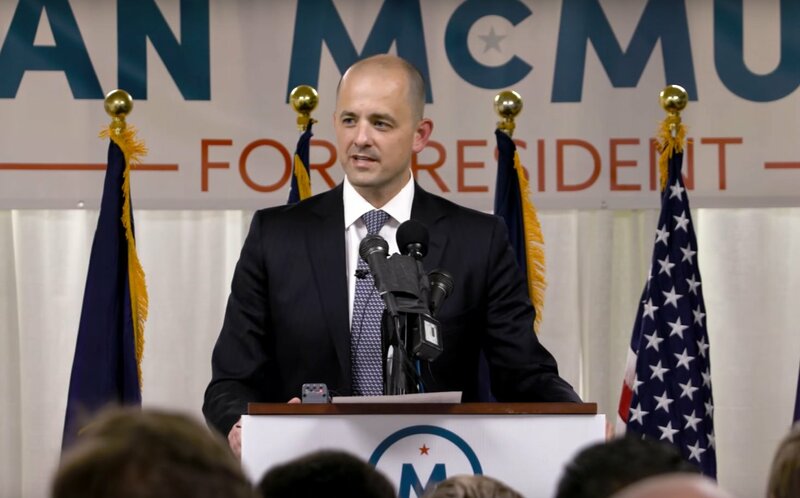 ST. GEORGE – Serving as a watchdog over President Donald Trump and Congress while also organizing Americans “in the defense of fundamental principles” is the goal of a new organization announced Wednesday by former independent presidential candidate Evan McMullin. Called “Stand Up Republic,” the group is described as being a nonpartisan and nonprofit organization and was co-founded with Mindy Finn, McMullin’s former running mate. McMullin told the Associated Press that the group will continue a movement he started while running against Trump as an independent candidate last year. McMullin, a former CIA agent, ran a three month long campaign against Trump in 2016. While he campaigned as a conservative alternative to Trump in various states, his campaign focused on Utah where he finished with 21.5 percent of the vote, making it one of the highest turnouts ever reported for a third-party presidential candidate. While on the campaign trail McMullin was an outspoken critic of Trump. He said Trump was not a real conservative and was more of a New York-style liberal than anything. Those criticisms have not stopped and routinely appear on McMullin’s Twitter account. The Trump administration did not immediately respond to an emailed request for comment from the Associated Press sent to the presidential communications office Wednesday. McMullin, who has roots in Utah and Washington state but lives in Washington D.C., said he has heard from more liberal-minded people who want to join his cause. The group will be active on social media and provide a way to fund raise and plan events for what McMullin called a growing grassroots movement. One popular voice expressing support for McMullin’s new group is gay rights advocate and Star Trek actor George Tekai. Part of Stand Up Republic’s grass roots campaign will include ads over television and social media. Among the first released Wednesday is a 30-second ad called “Secret” which focuses on Trump’s alleged connection to Vladimir Putin and Russia. While he currently isn’t engaged in a political campaign, McMullin may yet return to the campaign trail as he is considering a potential run for Sen. Orrin Hatch’s seat in 2018. He he has yet to finalize a decision concerning the matter. Evan McMormon, that’s who. And he’s gonna rescue us all! Where have you been McMullin? If you are really committed to “upholding the Constitution and protecting our rights” as you say you are, you should have been doing this during Obama’s presidency. I think you’re still whining about getting a poor showing during your campaign. Please go back under the rock from which you crawled! I agree with UtahGuns. The guy is a total clown and likely still working for the CIA in one way or another. But old CIA has gotten lazy, sloppy, or desperate if this is their main clown, lol. on top of that he’s a likely gay mormon. just gets better and better. Oh oh here comes another one Bob’s conspiracy theories ! You’re a class act yourself…what does it matter if he is gay? Though you do state that it ”just gets better and better” so maybe I am totally misinterpreting your comment…something tells me I’m not, unfortunately. I don’t care at all if he’s a gay man. But where do you find a more anti-gay religion than mormonism? Gays that try to be mormon, it’s just a little too desperate and a bit sad.